The EMC1428 is a high accuracy, low cost, System Management Bus (SMBus) temperature sensor. Advanced features such as Resistance Error Correction (REC), Beta Compensation (to CPU diodes requiring the BJT or transistor model) and automatic diode type detection combine to provide a robust solution for complex environmental monitoring applications. 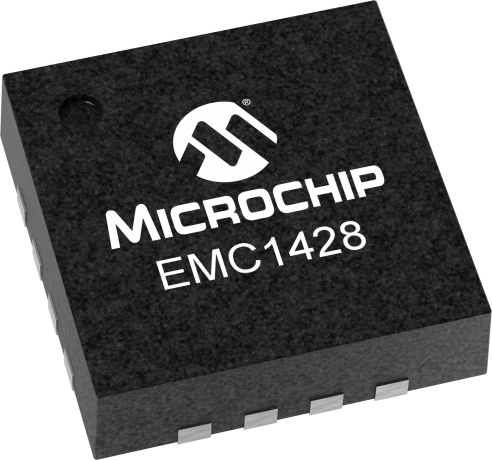 Additionally, the EMC1428 provides a hardware programmable system shutdown feature that is programmed at part power-up via a single TRIP_SET voltage channel that cannot be masked or corrupted through the SMBus. Each device provides ±1° accuracy for external diode temperatures and ±2°C accuracy for the internal diode temperature. The EMC1428 monitors up to eight temperature channels (up to seven external and one internal).